Olivia Fairhurst has the perfect summer’s day snorkelling and tobogganing island-style in Queensland. As the catamaran ferry glides through the ocean, a strip of land comes into view. 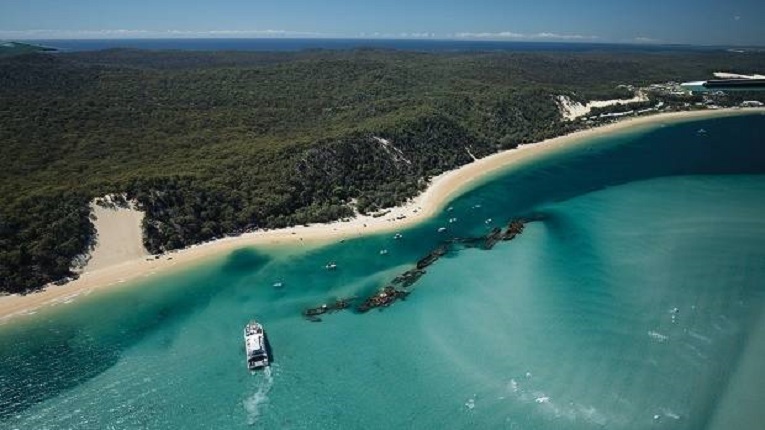 Thirty eight kilometres of Moreton Island to be exact. Throughout the 90-minute journey from the mainland, the overcast sky gradually splits to reveal blue skies sprinkled with cotton-candy clouds. Island life just a short journey away from big smoke Brisbane. The river of trees meets the endless white sand. Dusty cliffs bear buildings. But as the land nears, the water upstages its competitors. Turquoise ripples intertwined with teal reefs. The shore hits you with an entourage of colour. 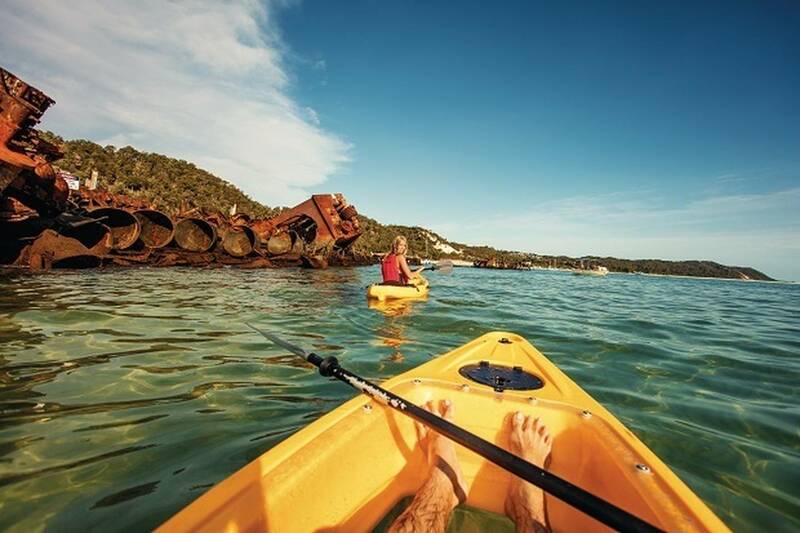 Our first adventure of the day is snorkelling through the Tangalooma Wrecks. A water baby myself, it’s a first to be snorkelling through 15 sunken ships. Donated by the Queensland Council, the ships peek above the water. And on their bright orange and brown rust, coral has made itself at home. The result — a man-made coral reef where a mixture of tropical and cool-water fish circle. The team at Sunset Safaris gears us up with wetsuits, gloves, masks and flippers to protect us from the ships’ ragged edges. Holding on to a jet ski, we’re pulled out about 200m to the wrecks. Dunking my head under, I’m welcomed by thousands of fish. “There’s one shark,” the instructor says. “But he’s friendly.” The world stops in its tracks as the coloured movement and sunlight flares slice through the blue, leaving me captivated. A different fish breed at every glance. “Turtle, turtle!” I hear. I frantically look around before settling myself in a swimming lane above it. It comes up for air before speeding off under the wrecks. Next form of transport: the transparent-bottomed kayaks. Floating above, it’s a perfect opportunity to capture the moment. The tour guide explains that the most colourful, bright fish of the school, the parrot fish, eat coral and excrete it into the sand. The process is important for Moreton, the third largest sand island in the world. We fuel up with food, ready for the next expedition: sand tobogganing. Imagine sledding through snow but island style. Four-wheel driving along the beach, the breeze lightly touches our faces and the shore glistens in the sun before we veer off into the Australian bush. A bumpy but adrenalin-fuelled ride leads us to a field of white sand. We stand beneath the hill, like a line of Mad Max characters ready for battle. Humans versus the dunes. On conquering the climb, my board is waxed and as I lie down nerves come to say hello. Pull the board up and put your foot down to straighten up, I’m told. I set off. Picking up speed, an instant smile spreads on to my face. Butterflies in my stomach make me crave more. I come to a gradual stop and despite the haul back up the hill, it’s worth two more trips. As the day ends and we depart on the ferry, I leave with the feeling of the end of a summer’s day — exhausted, satisfied and grateful.